Like Democratic Party organizations all over the U.S., the HTDems are led by our Committee members, who are elected to a 4-year term from their individual precincts. 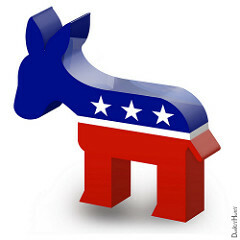 Every precinct elects 2 Committee, and each precinct’s Democratic Committee members serve as the neighborhood representatives for the Democrats in their precinct. Haverford Township is comprised of 9 wards, and every ward has 4 precincts. A full Committee in Haverford Township has 72 members. Committee members can be appointed in between elections if there are vacancies. Those elected to Committee have voting rights in local party policy decisions and internal elections, as well as voting rights within the Delaware County Democratic Party for endorsing candidates, etc. Individuals who are “ward leaders” may also be Committee but do not have to be. Committee members canvass their neighborhood Democrats to share information about candidates and encourage voting. They staff the polls on election day, serving as “poll watchers” and “greeters.” They also work with their ward leaders to recruit volunteers to canvass a few blocks in the ward and work a 3-hour shift at the local polling site so that Haverford voters know there is a Democratic presence in their neighborhood. Below is a list of Ward Leaders and Committee, organized by ward and precinct. Feel free to contact your ward leader any time. You can find out what ward you live in by referring to this ward map or, if you know were you vote, by identifying your ward by your voting location.